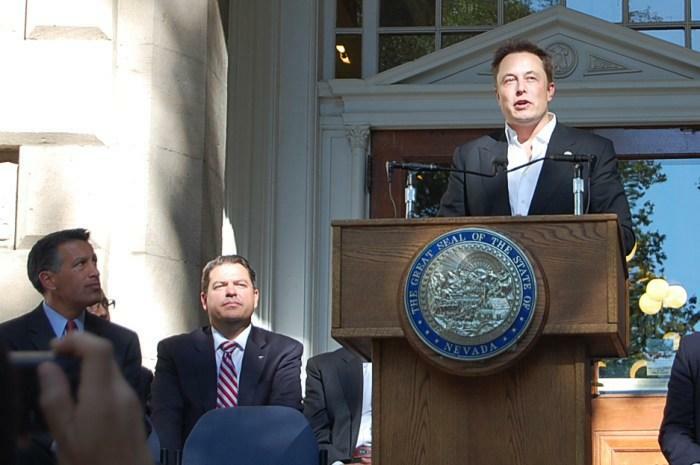 Tesla’s Elon Musk announces in 2014 the company’s plans to build its Gigafactory in Nevada. Governor Brian Sandoval looks on. Electric carmaker Tesla has received and sold about 20 million dollars in transferrable Nevada tax credits as it starts tapping into a hefty incentive package that lured its battery factory to the state. Tesla confirmed Monday that it sold the credits to casino company MGM in an arrangement first reported by ThisisReno. Bob Conrad runs that online news site and he's also a KUNR contributor. He says the tax abatements are part of a $1.3 billion dollar incentive package that state lawmakers approved in 2014. Conrad says it took a number of months to get that information from the Nevada Governor's Office of Economic Development. 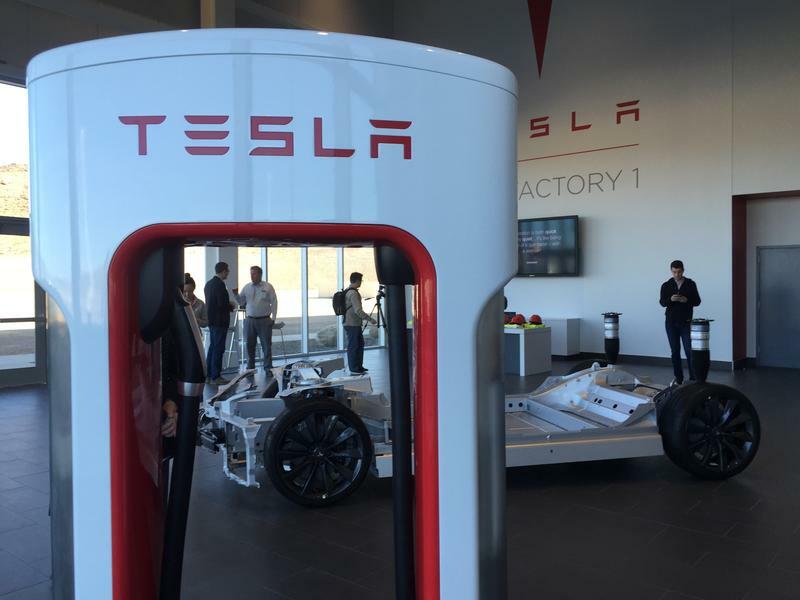 Supporters praise Tesla for diversifying Nevada's economy. Critics of the incentive package say local governments could suffer as Nevada forgoes some tax revenue while having to provide more services in order to handle population growth. A new minor being offered at the University of Nevada, Reno, is teaching students how to build batteries from scratch — the same type that Tesla is preparing to mass produce at the nearby Gigafactory. Graduate student Marylou Lindstrom is explaining the process for making a lithium-ion coin cell battery to a group of students decked out in white coats and safety goggles. She's one of 21 people enrolled in the Battery and Energy Storage Technologies minor added to the College of Engineering. Tesla says it is meeting its quota for hiring Nevadans, despite lingering protests outside their factory. 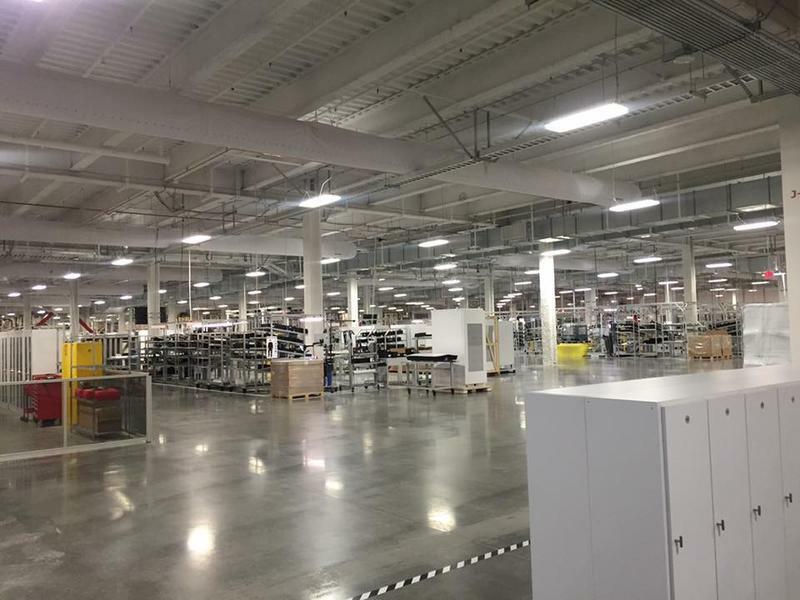 During a tour for local media last week, a Tesla spokesman says they are not yet at full capacity, but are meeting their headcount for hiring locals at the plant. Several dozen employees roamed about their massive production warehouse, which also houses temporary office space. Tesla opened its doors today to local media to get a glimpse of its progress at the $5 billion Gigafactory under construction in Storey County. Reno Public Radio's Julia Ritchey takes us inside. The echo-filled lobby of Tesla's battery factory is about one of three places journalists were allowed to record today during a two-hour tour at their massive compound inside the Tahoe-Reno Industrial Center. A spokesman for the company, who asked not to be named, gave several updates on their construction progress and production capacity.